Two Flowers for the Dragon | Manga Reviews ~ Ramblings of A Fob. I finally managed to read Two Flowers for the Dragon! Yey! I have been meaning to check this series out for such a time now. I’m rather fond of CMXs titles even though I have not had the chance to check most of their series. They licensed mostly unknown series, weird and bizzare and often old series. Unfortunately they went out of business. So yeah, Two Flowers for the Dragon was one of the last series they never got to finish before they shutdown. As happy as I am that I’ve finally read the first volume, I am as disappointed as to what happened to CMXs as this series. The concept of the story is what piqued my interest so I thought that the synopsis was unique, but after reading the first volume it was rather lackluster. The characters were generic – but seriously though, what series has a unique characters nowadays? – especially in shojo manga.. But anyway I never did liked any of the characters by the end of the volume. Shakuya is the princess of the dragon clan that guards the oasis (their kingdom) and she is the next in line to inherit to rule the land. It has been their tradition that these ruler must marry a person of the most noble status or some sort.. Shakuya is bethrothed to Kuwan and all is perfect; but then Lucien came to picture who turned out to be her former fiance, as so happened everyone thought he died out of sandstorm incident, it wasn’t fully explained yet.. So now Shakuya ended up having two eligible candidate for a husband.. In order to determine who will take her hand in marriage a symbol of love is literally in graved in both of her hand. A magical tattoo of a foliage will reflect her feelings towards the two guys. Whomever fauna blooms the most will be her husband.. Sounds rather interesting huh but in the end I could have only hoped for a better storyline. It started out ok but then as the story goes it seemed rather episodic I couldn’t care less about any of the trio. The characterization of them became cliche. Not much happened in the first volume, it just showed the differences of the two guys. I am definitely on Kuwan’s side since Lucien seemed to be just a happy go lucky guy who have lots of free time atm.. I normally root for the other guy instead of the main guy but in here we still don’t know who the “main guy” is.. I have this weird feeling that Lucien will win by just how things was played out. Its rather obvious that this series is set up for a Lucien-Shakuya pair but I’m seriously on Kuwan, he’s just more established I guess. Lucien went missing for 5 years and for that same time, Kuwan & Shakuya had been together. I also dislike the fact that Shakuya seem like in her teen age, but Kuwan is 26 years old. I assume Lucien is older or in the same age as Kuwan. Both Shakuya and Lucien’s age hasn’t been mentioned yet. 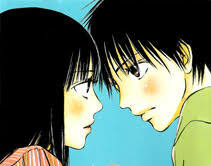 I don’t really like big age gap in my series, I find it abit creepy, lol. Interesting fact though, most of the author’s series has been licensed by CMX. I dunno if her titles did good on sales but I have read another series of her, The Recipe for Gerturde and I liked that one better than this one. But I remember I only liked the first couple of its volumes.. I think it was because the series turned into episodic rather than having to focus on one or two main story arc.. It same as Two Flowers, the first volume never did had any relevant story. The story seemed to have no established plot so to speak.. I have another volume in hand, the ending left with a cliffhanger so I might check it and determine if I like the story to follow through.. But yeah its abit of a bummer. Oh and sometimes there were minor “I’m confused” moments. There were instances that I also don’t know who were supposed to be talking. Sometimes I couldn’t follow whats happening, like in the beginning when Lucien was first introduced that was abit of a mess. It may just only me though..